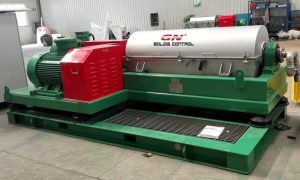 GN Solids Control is a comprehensive company which specializes in manufacturing solid control equipment and system. Since its establishment in 2007, it always focused on the quality and reliability, and how to help the customers save more money. 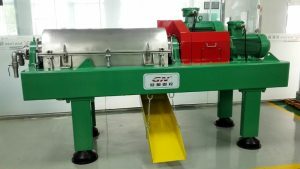 And among all the solid control equipment, there are 3 star products that have been proved to be more rugged, durable and reliable, they are: shale shaker, decanter centrifuge and cutting dryer. Today I want to talk about one of our best seller—-363 decant centrifuges. Its bowl diameter is 360mm which equals to 14 inch, and it is one of the most popular sizes centrifuges used in Oil and Gas industry. 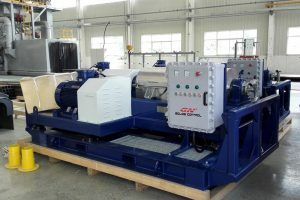 More and more drilling companies started to outsource the mud cleaning services to mud service company, and centrifuge technology is the newest intervention. All the configuration is high standard which can meet most of the customer’s requirement. The bowl material is made of duplex SS 2205/ SS 2304, the screw conveyor material is made of SS 304/ SS 315 and then the surface is protected by the tungsten carbide tiles which is more endurable and reliable, and it can save customer’s money both in operation and maintenance. And the solid discharge port is also used the tungsten carbide inserts. The bearing is still used the world famous SKF. The FHD system is VISCOTHERM full hydraulic drive. The electrical control system is smart PLC control. And the coating is used the Cosco & Kansai Zinc Rich Epoxy Coating. The equipment can be used in extreme high temperature environment with heavy mud situation. And the decanter is designed and assembled on a skid, which makes it easier to move and save time and cost for transportation. 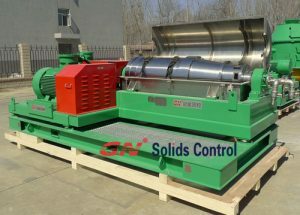 As a drilling fluids cleaning decanter centrifuge manufacturer in China, GN solids control keep improving the quality and design of our decanter centrifuge to meet the requirement for different clients and different applications. GN solids control brand is the top brand for solids control drilling fluids recovery, oil sludge treatment, oil recovery, drilling cuttings management. We can meet the different requirement for customized voltage and frequency, and explosion proof standard, like IEC EX, ATEX, CNEX for class 1 div 1. We can produce 9 inch, 14 inch, 18 inch, 22 inch, 30 inch decanter centrifuge, VFD decanter centrifuge is suitable for drilling waste management system, because the drilling fluids conditions are changing all the time, you have to use different frequency to change the differential speed and pump flow rate to keep the centrifuge working smoothly. GN solids control second new facility with high advanced workshop to produce decanter centrifuge and vertical cuttings dryer, we owns balancing machine for middle speed, high speed, big bowl centrifuge high speed for different size decanter centrifuge. The CNC machines can produce centrifuge bowl components by ourselves, the bowl material is centrifugal casting by duplex stainless steel 2304, better than stainless steel 316L, 304. The screw conveyor is made of SS304, the impeller opening is help to improve the treating capacity effectively. The tungsten carbide tiles can protect the centrifuge impeller from danaged, and it is repairable while it is broken. The bowl lifting bracket is to protect the bearing during road transportation and sea freight, which is the most important and expensive parts for the whole centrifuge. The important important issue for the decanter centrifuge working life is the centrifuge bowl assy, welcome to visit GN solids control centrifuge workshop to watch the production process of our decanter centrifuge, the faclity is located in Beijing, about 30 km from Beijing Airport.